Sometimes, you read a piece of literature so moving, so powerful, that your mood is swayed and your thoughts are altered. The world seems a little bigger. History seems a little richer. Your life doesn't seem all that bad, and maybe not as meaningless as you thought. This is what Lake Effect did for me the first time I read it. Each harrowing tale reaffirmed the importance of just one person, usually a person who felt completely helpless and drowned in sorrow during their living years. 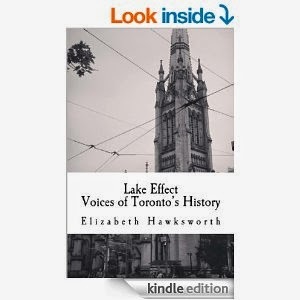 Tackling issues like immigration, feminism and love, Elizabeth Hawksworth jumps in feet first with these short historical works. Many deal with the plight of the Irish immigrants, and the stories span centuries, richly covering an overall historic goldmine through vignettes that will leave you breathless...some will even leave you horrified. But empowered. Each story, no matter how dark, speaks to the efficacy of human nature, the persistence of the mind and heart over any adversary. And when the characters don't make it, you know that someone did. That time is over, and we can learn from it, we should learn from it. Hauntingly beautiful, this book of vignettes from Toronto will deepen your appreciation of life, and deepen your life in general. And since the stories are short, it's a perfect read for a mom during naptime, too. I can't recommend it enough, to be honest. D. This is a perfectly amazing review. ILU.